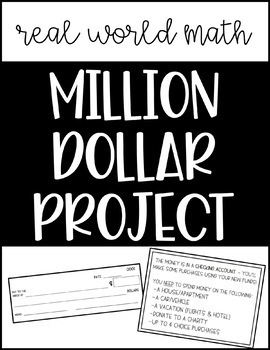 A fun project to practice addition, subtraction, division, fractions, writing numbers, while also learning some real-world money managing skills! 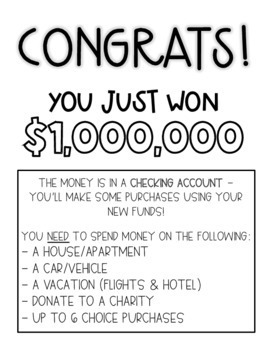 Students are "given" $1,000,000 to spend on a house, car, vacation, donate to charity, and then some choice purchases. 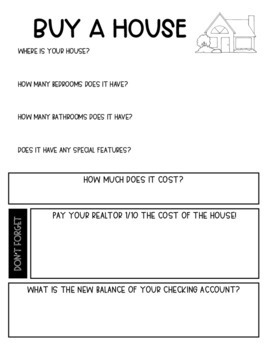 Students receive their own checkbook with register, and need to learn how to write a check and balance the checkbook. I let my students use real websites for this project, and there's a page included where they can take notes on what they learn from the sites. We use Zillow, Kelly Blue Book, Expedia, and CharityFinder. 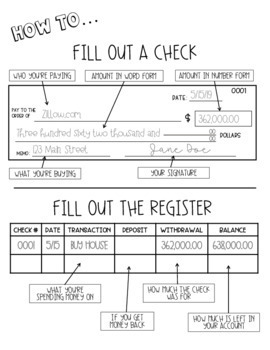 I first teach students how to write a check and balance the checkbook. Then, we go section by section through the packet. I teach them how to use each website as we reach each section, and then give them a few days to play around and find what they want to buy. This project is perfect for the end of the year when we need a fun way to practice the skills we've used throughout the year!